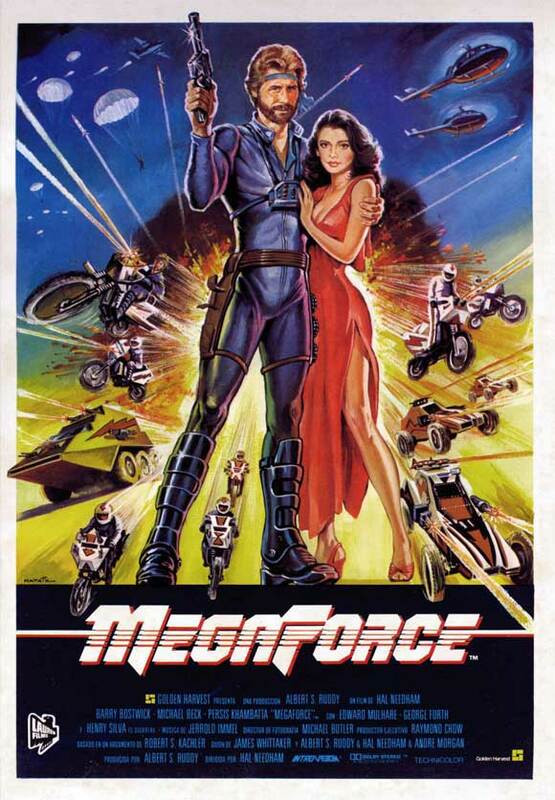 After hearing so much about how bad Megaforce was I had to see it for myself. Whenever they showed pictures or footage it did not look that bad to me. And with actors like Edward Mulhare (Knight Rider), Barry Bostwick, Michael Beck and Henry Silva the movie can't be that bad right? Wrong! Yes, it can. It's horrendously BAD! Worse is that they supposedly spend like 20 million US dollars on it. I mean that is a lot of money for one of the trashiest movies ever made. And what on Earth did they spend so much money on? Must have been the explosions. 40 minutes into the movie after seeing a lot of heterosexual men (we only can assume) wearing the tightest spandex suits that surely must have been an assault on their junior members, having the most cringe worthy dialogues (I won't repeat that here in fear of damaging your sense and sight) we finally get to see Megaforce in real action. And see is a big word because all that I was able to catch a glimpse of was smoke, smoke and more smoke. Here and there some fireworks and laser beams. Most of the action consists of these sci fi like desert buggies and motorbikes riding around accompanied by explosion after explosion. That is it. I am not joking. That really is all there is. Oh,wait. There is this super jump. Which must have been the moment they were out of money since it looks atrocious. Aren't there any redeeming factors? Well, most of the cast do play like they are in a comedy. So at least they weren't taking this serious. Imagine if they would. Then there is Persis Khambatta (known for Star Trek The Motion Picture). Her presence added some grace and at the same time makes you think how she and other members could have been suckered into this adventure gone horribly wrong. Surely they must have suspected when reading the scripts. Even then will it take a lot of showers and bleach to get rid of the smell of cheese after exposing yourself to Megaforce. DON'T WATCH THIS MOVIE EVER! You will get nightmares for sure!